If you enjoy slot games with tons of sparkling gems to discover which turn into prizes, quirky reel set-ups, and some fantastic bonus games, then it’s time to be astonished by Dazzle Me, a super enjoyable video slot from Net Entertainment. Dazzle Me is a five reel video slot with a variable number of rows featuring 76 fixed pay lines. The innovative bonus features include linked reels, free spins, dazzling wild reels and scatter symbols with a top paying jackpot bonus worth 200 times your total bet. The background contains several sprinkling lights that have been portrayed through a hazy filter. The reels have been surrounded by a gold frame while the symbols are presented in front of a white backdrop. There is a total of six symbols, including two traditional symbols which is the seven and bell symbols. The remaining symbols include blue gems, green gems, purple gems and red gems to complete the range of symbols found on the reels. With 70 different bet options and coin-value combinations to select from, you can find the perfect bet range that suits your playing style while enjoying everything this fantastic video slot has to offer. Simply decide on the bet level of your choice ranging from 1 to 10 and then place a coin value ranging between $0.01 to $1.00. This will give you a minimum bet of $0.02 on a single spin, and a maximum bet of $20.00 on a single spin. Dazzle Me does not feature any wild symbols. However, it does contain a scatter symbol in the form of a Free Spin icon that activates the main feature available in the game. This is a randomly triggered base game feature that will transform between one and five of the reels completely wild to give you more winning possibilities. You won’t always trigger a big win when this feature is activated, but when it does you can expect a rather big win. The free spins are triggered when you manage to land three or more Free Spin scatter symbols anywhere in view on the reels. Once triggered, you will receive 8, 12 or 16 free spins for displaying three, four or five Free Spin scatter symbols on the reels respectively. Once the free spins get underway, the Linked Reels feature will also be activated where reels one and two or reels three and four will present identical symbols. Much like the Dazzling Wild Reels feature, wins are not always guaranteed, but once a winning combination is triggered, you can expect a big payout. Unfortunately, the free spin feature cannot be re-triggered while the free spins are underway. 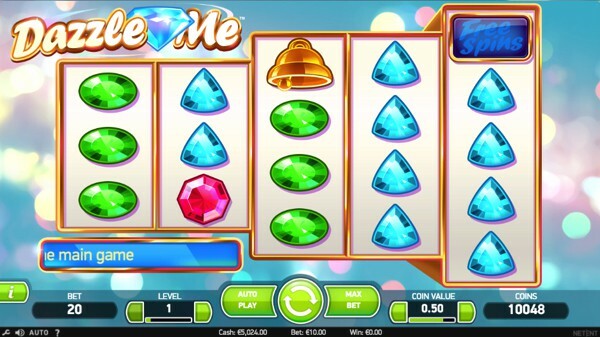 Dazzle Me provides a bunch of precious gemstones that are always appealing, but it’s the video slot’s innovative bonus games and quirky reel setup that sets this game apart from its peers. It’s a game worth playing, providing a medium volatility level that will give you frequent payouts with a decent prize ratio. The Return to Player has been set to 96.90%, so you can expect some regular wins while spinning the sparkling reels of Dazzle Me.